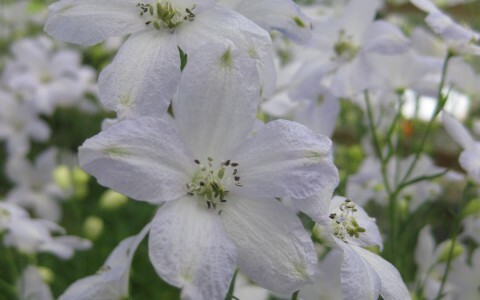 Six dwarf Delphinium varieties for pot and bedding plants are available with the color range of dark blue, blue, light blue, light lavender, light pink and very light pink. The flowers bloom upwardly as there are no spurs on the buds. Cool Mint is the earliest in flowering followed by Aqua Blue, Mint Blue, Tiara Blue. The latest flowering varieties are Fantasista and Milky Mint. The flowering speed difference between the earliest Mint Blue and the latest Milky Mint is 1 – 2 weeks depending on the climate.